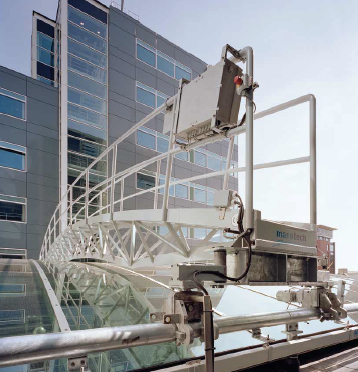 Gantries and Work Platforms form a distinct group of products within our economic range of facade access solutions. Manntech have the expertise to develop the most appropriate access system which make safety requirements a priority, provide high quality equipment and parts, all of which blend seamlessly with the architectural vision of each building. Gantries can deliver an economical solution for buildings of lower complexity which have lower working height requirements and limited facade surfaces. Gantry systems can run on roof tracks or just below roof lines where they can travel around the perimeter and then descend horizontally for building maintenance. Manntech’s Gantries are custom-made from standard components to address the particular needs of the building.